Today Whole Woman’s Health is taking the next step in fighting HB2 in Texas. 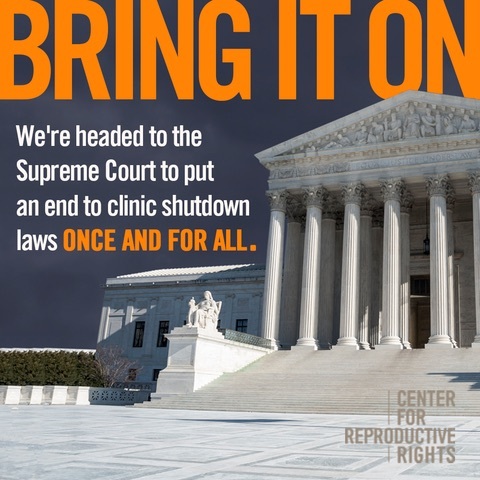 With the help of the Center For Reproductive Rights, we asked the U.S. Supreme Court to review a June 2015 decision from the U.S. Court of Appeals for the Fifth Circuit – a ruling which upheld a law that would close more than 75 percent of abortion clinics in Texas. This filing will ask the Court to formally review the case to permanently block enforcement of the two most harmful components of HB2 – the ambulatory surgical center (ASC) provision and admitting privileges. “It’s been a long and arduous road to get to today’s filing, but that’s nothing compared to the obstacles that Texas women seeking reproductive health services will face if the Supreme Court of the United States denies our request and allows HB2 to fully go into effect. By passing HB2, lawmakers forced us to permanently close our clinics in Beaumont and Austin. While our Fort Worth and McAllen clinics are currently open, they have both had to close at various points over the last two years, leading to financial strain and overall confusion–some women even questioning if abortion is still LEGAL in the state of Texas. I’ve said it before and I’ll say it again: these restrictions have nothing to do with protecting women and everything to do with closing down clinics and pushing abortion care out of reach. When politicians force clinics to close, they multiply the devastating albeit unnecessary hurdles that Texas women must overcome when seeking reproductive health care. Our ability to get safe medical care should not depend on whether we have the resources necessary to navigate a horrific and complex obstacle course dreamt up by anti-choice lawmakers. This is the real world and these laws have real implications on real women’s lives. Right on!! Thank you all for your courage and dedication. There is a cost for standing for others and I am personally grateful for your persistence and dogged determination!